A spokesman for Gov. Tom Wolf (left) says members of the School Reform Commission can’t run for any political office. Commissioner Bill Green (right) disagrees. Gov. Wolf says the law is clear: School Reform Commissioner Bill Green can't run for Congress. But Wolf, who has locked horns with Green in the past, doesn't intend to oust him from the state-created SRC anytime soon, even as he campaigns for Pennsylvania's Second District seat in the U.S. House. The reason? The Wolf administration said it doesn't want another costly lawsuit over Green. "At this time, we have no plans to try to remove Mr. Green," said Wolf spokesman J.J. Abbott. "We do not believe it is worthwhile for the commonwealth to risk spending another cent on litigation over Mr. Green's unpaid position that will be abolished in a few months." 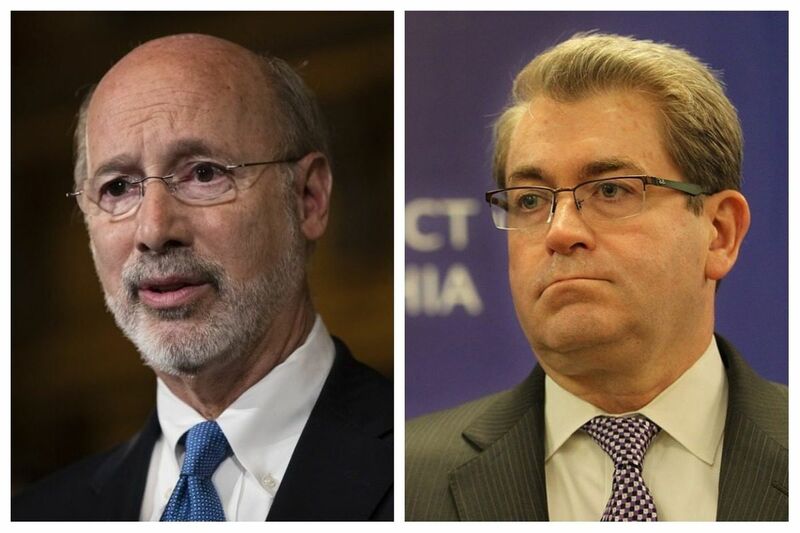 Wolf demoted Green, who had been appointed by his 2014 Republican opponent Gov. Tom Corbett, from his position as SRC chairman in 2015. Green sued to get his job back, and lost. In a sharply worded statement, Abbott said that Green "retained a conservative special interest group to foot his legal bills" in that suit. The Fairness Center, an organization that says it provides "free legal services to those hurt by public employee union officials," represented Green. Abbott said he could not provide an estimate of the suit's cost to taxpayers because lawyers employed by the state handled the case. Green, a Democrat, is challenging U.S. Rep. Brendan Boyle in the primary. Green and the School District's Office of the General Counsel have maintained that he can do so while sitting on the SRC. Pennsylvania law states that "no commission member may, while in the service of the School Reform Commission, seek or hold a position as any other public official within this commonwealth." Miles Shore, the Philadelphia School District's deputy legal counsel, said previously that "the definition of 'public official' in the Ethics Act does not include any federal positions," adding that the Ethics Act is the "most pertinent legal authority" on the issue. Abbott said "our interpretation of the law is that no SRC commissioner can run for any political office." Three election lawyers who examined the issue at the request of the Inquirer and Daily News agreed with that position. Asked for comment, Green reiterated that "the district's lawyers were consulted in advance" of his decision to run for Congress "and their advice is being followed." The Alliance for Philadelphia Public Schools, an education advocacy group that has been critical of Green, sent a letter to Wolf last week urging him to "immediately remove" Green from the SRC. "No one, including Mr. Green, can serve on the SRC while seeking public office. There is no question that a person serving in the U.S.Congress is a public official," the organization wrote. The SRC will cease to exist in June, when local officials take back control of the city's schools. For Green and Wolf, the standoff seems the perfect coda to their relationship. Green is a former City Councilman whose father, a former mayor, and grandfather were both congressmen.